Back in high school, a Vietnamese friend introduced me to a Colombian restaurant in Central Falls, RI where he grew up called, El Paisa (the irony here is that I have a Colombian friend from Central Falls as well, but he didn’t bring up the restaurant). This quickly became one of our favorite places to eat because the portions of hearty home-style cooking were enormous (try La Bandeja) and the costs minimal. Nothing was especially fancy, but everything tasted great (except for the dry mini-arepa that came with most meals). When I went to college, I went through El Paisa withdrawal and became desperate for some Colombian food. I used our clunky early 2000’s college internet and found a restaurant called, “Camino Real” in Allston, MA, which provided essentially the same exact menu as El Paisa, but added a twist by topping their signature dish with a fried egg. That was my first fried egg on top of an entree experience and it would not be my last. Recently, I went to Los Andes in Providence, RI for the first time. Unlike El Paisa and Camino Real, Los Andes is actually Peruvian. 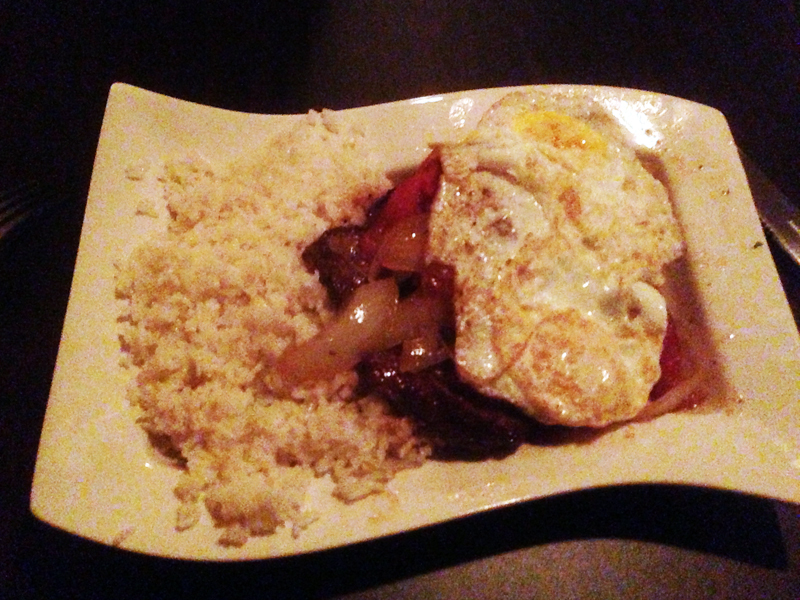 Nonetheless, their food on the menu is extremely similar to Colombian food. Staple items like chicharron, fried plantains, and empanadas littered the menu. Most notably, everything had eggs in it or on it (ok, maybe not everything, but almost everything. Seriously. Check out their menu). They already had me at eggs, but I wanted to try a bunch of things on the menu. On to the review. When you enter Los Andes after finding street parking, you have to walk along the length of their bar to the host stand. On a Saturday night, the place starts to get jammed around 7:30 pm, so try and get there sooner if you can. We ended up waiting about 20 minutes to get seated and stood awkwardly behind patrons seated at the bar trying to pretend we were admiring the giant fish tank in the wall rather than leering hungrily at their food. Once seated, the atmosphere feels like being in an Italian Eatery where the tables are all kind of close together, but you still have a little privacy at your table. Even though the place was really busy, it didn’t seem like it was too loud or invasive when trying to have a conversation. Our server was attentive and offered suggestions solidly when I asked her to help me choose between two dishes. She promptly took our drink orders and kept the pace of our meal moving quickly, but not rushed. As soon as anyone mentions Los Andes, the immediate response from someone that’s been there before is, “You’ve got to try the Pisco Sour!” So, we did (and yes, it also has eggs in it!). I’m not really sure what all the hubbub was about because while the drink was nice, it didn’t really blow me away or anything. 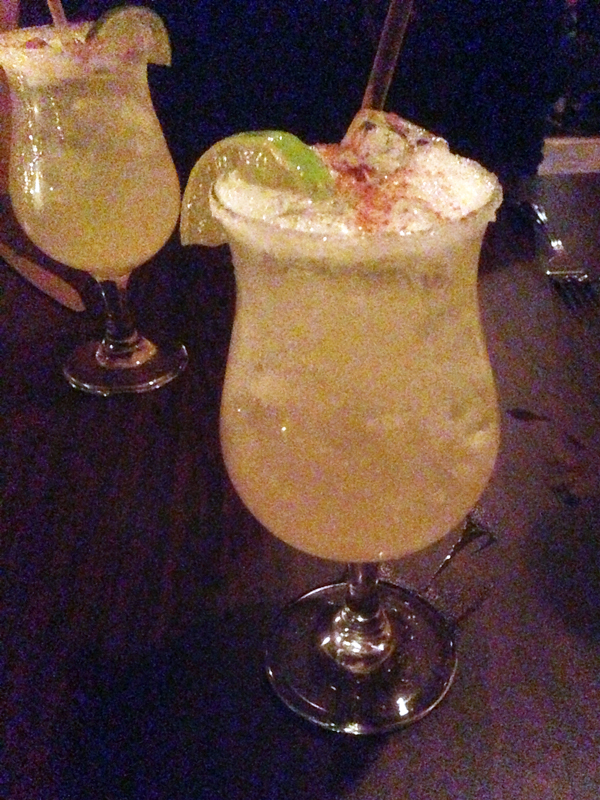 It tastes like a typical “sour” drink that could be compared to a whiskey sour or something like that. Don’t get me wrong because it was well done for what it was. 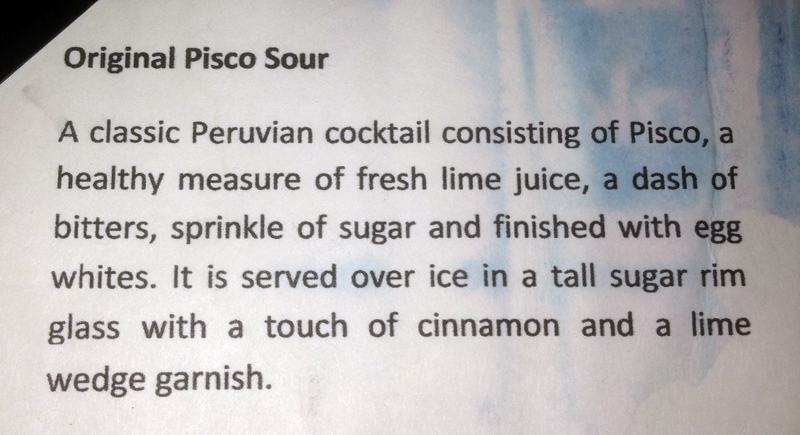 I don’t regret getting it because I got to try Pisco, which I’ve never had before, and if you like sour drinks then this is very well done. All in all though, I don’t think it complemented the meal well because it was too sweet. While standing in the bar area waiting to be seated, I saw the bartender bring someone a martini glass full of seafood. Immediately, I knew that this would soon be mine. 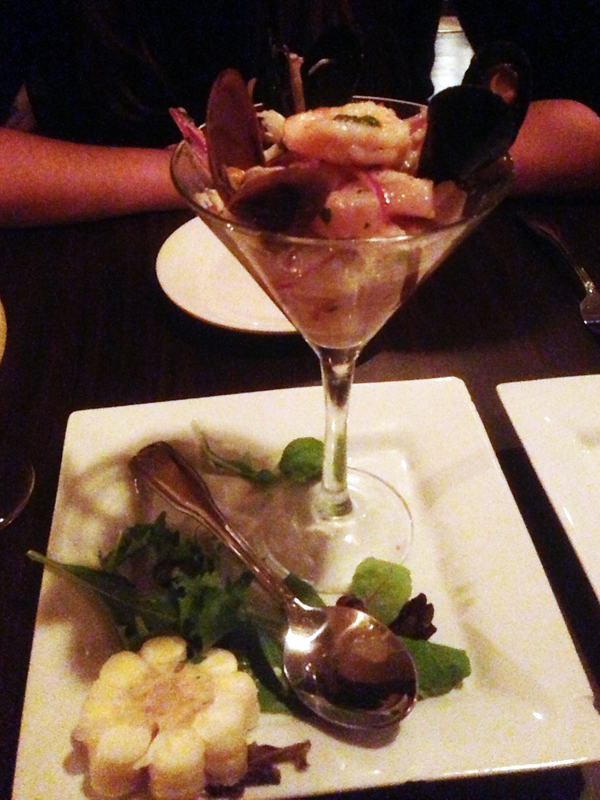 On the menu, it is simply called a Ceviche Martini and that’s exactly what it was. Really fresh, tender pieces of tilapia, calamari, shrimp, and mussels came bathed in Peruvian Leche de Tigre (Tiger’s Milk), which usually consists of lime juice, seafood juices, salt, pepper, chile spices, and onion. The pieces of seafood tasted great cooked only by the acid of the Leche de Tigre and with all of the fresh ingredients, the dish remained a light start to the meal. The only problem with this dish was that for my personal tastes, I think they went a little overboard with the lime juice. Every piece was just really sour. I’ve had ceviche before and while I understand that the seafood needs the acid from the lime juice in order to cook properly, this was just a little too much. I think they served this with a small piece of hominy (bottom left), which is corn, but with very large kernels and a sort of potato consistency. 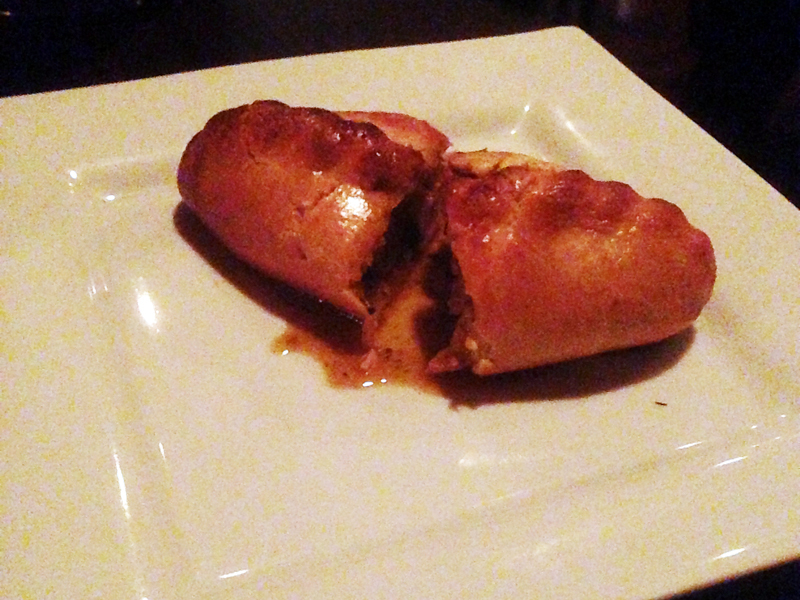 We also tried the Salteña or classic Bolivian chicken pie. The pie came out warm without any fanfare as just a lone empanada-like figure on a bare plate. That was completely fine though because the pie spoke volumes for itself. The outside pastry crust was crispy and cooked perfectly while the ingredients inside were tender. The large chunks of chicken smothered in a mildly spicy red-brown sauce were absolutely delicious. I would be hard pressed to compare the two appetizers because they are just completely different, but I may have preferred the Salteña due to it’s simplicity and comfort food style. I will tell you right now that I simply could not decide what to get as an entree on this menu. Aside from the fact that everything on the menu looked delicious, it was all so similar that I just had no idea where to start. Almost every meat dish had an egg on it with some minor variations in cut and preparation of the meat. After agonizing for what seemed like an eternity, I finally narrowed my choices down between a pan-seared top round dish called the, “Chorellana,” and a shredded beef dish with plantains called, “Majadito de Charque.” When our server came to take our order, I looked up at her with wide helpless eyes and asked her opinion between the two choices. She immediately, without hesitation, told me to get the Chorellana because it had an “amazing sauce” and with that the deal was done. My dish came out and immediately reminded me of El Paisa or Camino Real because this was just hearty home cooking in a restaurant setting. Granted, Los Andes, was a little more upscale in not only the atmosphere, but in the preparation of the food. The rice had some broth, garlic, and lime flavor to it which gave it a lot of character and reminded me a lot of a classic Egyptian dish called, “fata” (not to be confused with the Greek feta cheese although pronounced similarly). The meat, although pan seared wasn’t dry at all and seasoned very well. The onions and tomatoes combined with the meat’s juices to create a really great sauce just like the server said. The meat rested on a few roasted potatoes and on the meat rested (you guessed it) fried eggs! The eggs really did add another element of texture and flavor to the dish as they mixed with the sauce and rice. This entree was really really good and felt like something your mom would make at home if she was raising little protein-hungry body builders. I also got to sample a dish with the name of the restaurant in it called, “Pollo a Los Andes.” I can’t even compare it to the Chorellana (above) because it consisted of chicken, chourizo, mozzarella cheese, tomatoes, onions, and potatoes. 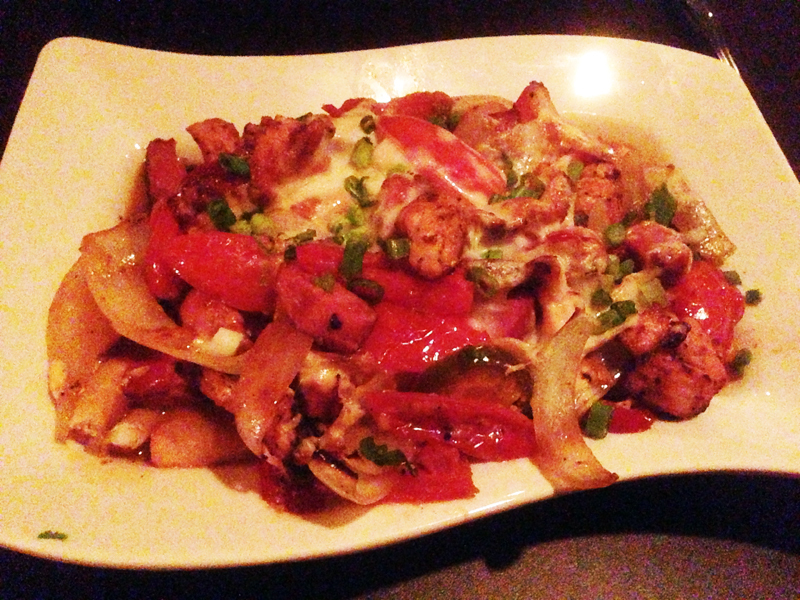 The cheese coated the tender, chourizo-infused chicken and the potatoes absorbed all of the individual flavors. Also unlike the hearty Chorellana, which had a comparably more subtle flavor profile, the Pollo a Los Andes overwhelmed me with flavor (in a good way). The only drawback was that it was incredibly filling. While I finished most of the Chorellana and felt very full, I don’t think I could have finished the Pollo a Los Andes. Nonetheless, the flavor combinations, while not particularly difficult (i.e. you could make this at home), were outstanding. Los Andes is just a great place all around. The appetizers and drinks were creative while the entrees were a shining example of quality comfort food that is easy on the wallet. I highly recommend a visit for dinner, but bring your appetite because you’ll want to try everything!